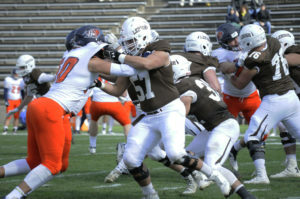 Lehigh football snapped a seven-game losing streak by defeating Bucknell at home 45-17 on Nov. 3. The win was a much needed confidence booster for the Mountain Hawks, who were trounced by Holy Cross 56-0 last weekend. On Saturday, however, the offense and defense were playing their best football of the season. Head coach Andy Coen was ecstatic about the team’s effort. Sophomore wide receiver Jorge Portorreal (216 yards, 2 TDs), senior running back Dominick Bragalone (177 yards, 1 TD) and senior quarterback Brad Mayes (335 yards, 2 TDs) kickstarted a dormant offense with notable performances. The game started off well for the Mountain Hawks when they took a 7-0 lead early in the first quarter, their first lead since the second quarter against Penn on Sept. 22. It started when Lehigh punted from its own 5-yard line, and junior defensive back Jon Seighman recovered a muffed return after the ball ricocheted off Bucknell returner Bryan Marine’s leg. After a big 35-yard catch by junior wide receiver Devon Bibbens along the sideline, Bragalone broke free for a 27-yard touchdown run, his 43rd of his Lehigh career, a Mountain Hawk record. Bragalone remained humble about his accomplishment. Bragalone felt especially proud of the offensive line, who put behind their seasonal struggles to aid in Bragalone’s performance. With time running down in the second quarter, a 24-yard run by Bragalone opened up the offense. Mayes then completed a 56-yard touchdown pass to Portorreal to give Lehigh a 21-6 lead. Bucknell responded with a big kickoff return, and in just 34 seconds, the Bison were in the endzone with a two-yard score from Tarrin Earle to receiver Alan Butler. The two-point conversion was in from running back Jared Cooper, cutting the lead to 21-14 at halftime. After the half, Portorreal broke free on an inside route for a 72-yard touchdown, giving him 216 receiving yards and two touchdowns on the day. It was the first 200 yard receiving game since former Mountain Hawk star Troy Pelletier’s game against Yale in 2016. A 17-yard run by freshman running back Rashawn Allen stretched the lead to 38-17, and a 65-yard interception return for a touchdown by defensive back Marquis Wilson firmly sealed score at 45-17 in Lehigh’s favor. Following a made extra point, kicker Ed Mish broke the all-time Lehigh record with 226 total kicking points. Lehigh returns to action next Saturday when it hosts Colgate at Goodman Stadium for a 12:30 p.m. kickoff.